Circulation Date : 1970's. Fits a Belt Size up to : 1 3/4". Fits a Belt Size up to : 1 1/2". Condition : This buckle has never been worn, but might show age or handling. Fits a Belt Size up to : 1 1/2". Circulation Date : 1970's or early 80's. Fits a Belt Size up to : 1 3/4". Belt Buckle. Condition : This buckle shows age, wear & handling. Fits a Belt Size up to : 1 3/4". Great condition! Normal wear. Approx.Size is 2 3/4 X 2 1/4 & fits up to a 1 & 3/4 belt. Condition : This buckle has never been worn, but might show age or handling wear. Circulation Date : 1970's or early 80's. Fits a Belt Size up to : 1 1/2". 3 1/4" wide x 2 1/4" tall. Embossed Semi truck design. Will fit a 1 3/4" belt. Condition : This buckle has never been worn, but might show age or handling wear. Fits a Belt Size up to : 1 1/2". 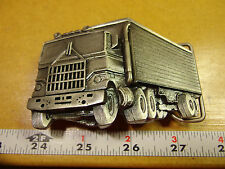 Trucker buckle with image of 18 wheeler. I found 2 of these at a Estate sale in a box. It looks to be very old. Materials : Pewter. Condition : This buckle has never been worn, but might show age or handling. Fits a Belt Size up to : 1 3/4". REALLY GREAT BUCKLE ! NICE HEAVY WEIGHT BUCKLE. (4.7cm) Max. Belt Width. WE CAREFULLY INSPECT EACH ITEM AND TRY TO. A GREAT ONE TO ADD TO YOUR COLLECTION ! U.S.A. CANADA OTHERS. IMPORTANT . F97 BEAR & CUB. BRASS TONE BELT BUCKLE. - Great Collectible / Wearable Belt Buckle. Can be added to your favorite leather belt! This item has been previously worn. REALLY GREAT BUCKLE ! NICE HEAVY WEIGHT BUCKLE. REPACED BELT HOOK. (4.3cm) Max. Belt Width. WE CAREFULLY INSPECT EACH ITEM AND TRY TO. A GREAT ONE TO ADD TO YOUR COLLECTION ! U.S.A. CANADA OTHERS. Very good condition showing typical wear from age and use including light scuffs and scratches. Wears and displays very nicely. Great color, weight and design. Fits a Belt Size up to : 1 3/4". Condition : This buckle has never been worn, but might show age or handling. Circulation Date : 1980's. Fits a Belt Size up to : 1 1/2". Condition : This buckle shows age. Fits a Belt Size up to : 1 3/4". Condition : This buckle has never been worn, but might show age or handling wear. Fits a Belt Size up to : 1 3/4". Condition : This buckle has never been worn, but might show age or handling wear. Circulation Date : 1980's. Materials : Solid Brass. Very good used condition showing typical wear from age including light scuffs, MINTY, great color and weight, looks great with an old pair of jeans, wears and displays nicely VHTF Rare. BRASSTONE BUCKLE. REALLY GREAT BUCKLE ! NICE HEAVY WEIGHT BUCKLE. A REALLY UNIQUE & COLLECTABLE BUCKLE! (4.4cm) Max. Belt Width. WE CAREFULLY INSPECT EACH ITEM AND TRY TO. U.S.A. CANADA OTHERS. REALLY GREAT BUCKLE ! NICE HEAVY WEIGHT BUCKLE. (4.6cm) Max. Belt Width. WE CAREFULLY INSPECT EACH ITEM AND TRY TO. A GREAT ONE TO ADD TO YOUR COLLECTION ! U.S.A. CANADA OTHERS. IMPORTANT . REALLY GREAT BUCKLE ! NICE HEAVY WEIGHT BUCKLE. REPAIRED BELT HOOK. (4.4cm) Max. Belt Width. WE CAREFULLY INSPECT EACH ITEM AND TRY TO. A GREAT ONE TO ADD TO YOUR COLLECTION ! U.S.A. CANADA OTHERS. 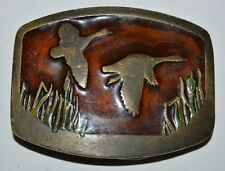 The buckle features a close up view of one mallard along with a couple other ones flying over a marsh area. Vintage 1976 "Colt Revolver" Belt Buckle Gun Cowboy on Horse #XR79 Indiana Metal. Shipped with USPS First Class Package. Gun with Cowboy on Horse. This belt buckle is from a massive collectors estate. Majority of buckles were displayed on a wall or glass cabinets. More will be added daily! Year: 1976.